The stamp card offer is valid at Solley’s Ice Cream Parlour, The Dairy, Church Lane, Ripple, Deal, Kent CT14 8JL only. All stamp cards are valid until further notice, even if an earlier termination date is indicated on the stamp card. 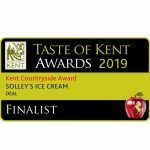 One stamp will be issued for every ice cream bought at Solley’s Ice Cream Parlour. 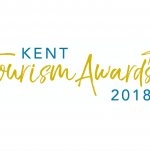 You must present the stamp card to collect your stamps at the time of purchase as we will be unable to issue stamps at a later date (even if a receipt is produced). Solley’s Ice Cream Parlour reserves the right to stop issuing stamp cards and to withdraw the stamp card scheme at any time and on such notice as it shall deem appropriate. In such a case, it will endeavour, but does not guarantee, to give reasonable notice to allow any cards to be redeemed in accordance with paragraph 5 below. 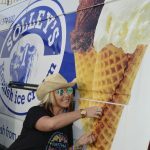 To claim your free Solley’s Ice Cream cone, you must complete one stamp card with nine stamps and present it at Solley’s Ice Cream Parlour. Photocopied, altered or defaced stamp cards and/or stamps will not be accepted. We may treat as void any stamp card you present if we have reasonable grounds to suspect that you are in breach of these terms and conditions or your participation is fraudulent, unlawful or you have otherwise engaged in behaviour which is contrary to the spirit of the rules or the intention of this promotion. The stamp card cannot be exchanged for a cash alternative. Use of this stamp card implies acceptance of these terms and conditions of use. Stamp cards are issued by and remain the property of Solley’s Ice Cream Parlour who reserve the right to (i) take any action deemed necessary if it reasonably believes you have misused the card; and (ii) on reasonable notice to alter or amend the terms and conditions of operation of the stamp card.